Nauheim sharp-gabled rooflights are ideal for building roofs as well as separate roof sections. They are infinitely variable in pitch and construction width, and can be easily integrated into any existing architecture. The specific requirements for fire protection and ventilation are met with customized light louvers. They blend harmoniously with the overall design. 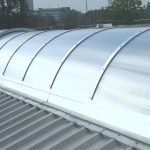 Nauheim gable rooflights are produced with 20 deg. or 36 deg. pitch. The skylight width is also variable, and the grid width is 1.06 m. The supporting structure consists of natural polished aluminum rings of AlMgSi and glazing beads with EPDM gaskets, which are connected to one another with stainless steel screws. Glazing is made with hollow chamber polycarbonate panels in accordance with applicable technical standards.